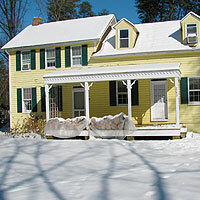 The owner of this two story farmhouse, Henry Alfred Cook, married Rhoda Virginia Hancock, who was born upstairs at Hancock’s Resolution. 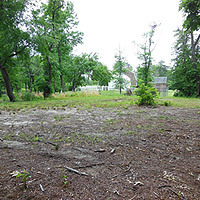 Constructed in the mid 1800s with an addition added later in the century, this house was originally located approximately a mile west of its present location. It was moved to the park in 1991 to serve as a care taker’s home. 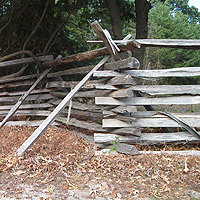 The traditional “Snake and Cross” or “Zigzag” fence is based on remnants of the original fence. The 11 foot, hand split rails would have been constructed of chestnut. The chestnut blight killed most of the towering trees in the early 1900’s. 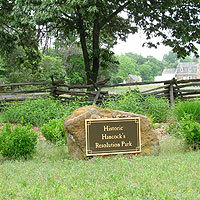 Hancock’s Resolution is now a Historic Park in the Anne Arundel County Park System. While farmsteads like this used to cover this county side (except this one was constructed with stone while the great majority were wood frame) this c. 1785 stone house and milk house are the last surviving authentic, restored but not renovated, farm structures left in the entire region. 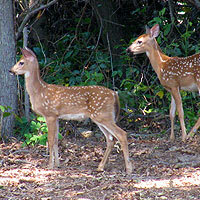 As such they are of singular importance. (1785 was four years before George Washington became President of the United States. 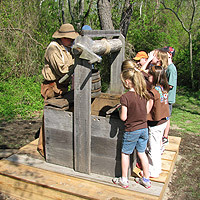 The well is believed to have dated from the 18th century when the house was constructed. The well remained in use until the 1950’s when the elderly Mamie Hancock could no longer manage the daily chore of hauling water for everyday use and a modern well with hand pump was installed closer to the house. Approximately 14 feet deep, the well is lined with stones “dry laid” and is untouched except for repairs at the frost line. This is believed to be the site of an early barn. At some future date, we hope to reconstruct the barn and have farm animals. Stephen Hancock built the house in 1785 and Hancock descendents continued to live in the house until the 1960s. Lacking electricity, plumbing and central heating the house is largely unchanged since its construction. The house is constructed of native sandstone. 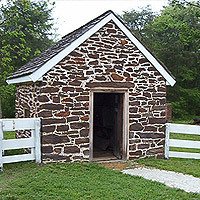 Galleting is used on the entire wall surface of both the house and the adjacent milk house. 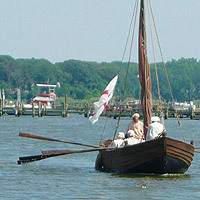 It is the only known rural example of this technique in the Chesapeake region. The first floor contains one large room with plaster over hand-split lath. Original Federal period trim, including baseboards, chair rail, window and door surrounds, decorate the room as does the elaborate mantelpiece. A “kitchen garden” located just outside the home consisted of both foods and herbs and ornamental plants. 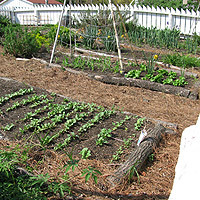 Kitchen gardens were common place into the 1900s. 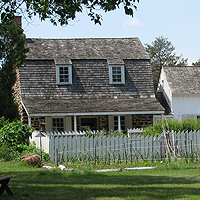 The current garden is a historically accurate reconstruction of the Hancock family garden. A grove of ancient Lilacs and a thicket of Chickasaw Plums (known to be utilized by the pre-Colonial Indian populations of Anne Arundel County) are found outside the gardens. The Hancock family ran a dry goods and grocery store in the 20th century. 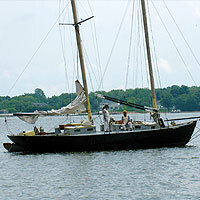 The store served the local farmers, lighthouse keepers, fisherman, and oyster dredgers as well as the seasonal workers who were employed at the farm. 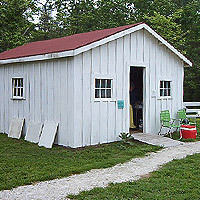 This current building is a historically accurate reconstruction of the frame building and houses displays and a small gift shop. In the 18th and early 19th century dairy products were stored in the milk house. The Hancock family used the building as a grocery and dry goods store in the early 20th century until the frame building was later constructed. It also has the galleting that is also used on the house. Bee hives in boxes, baskets or even parts of hollow logs were a part of traditional farming practices. 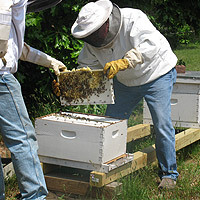 Beehives were documented on Francis Hancock’s 1832 probate inventory; honey and beeswax were important to both 17th and 18th century farms. The bees at the farm are tended by the farm’s master gardeners and housed in modern “Langstroth’s Hives.” These movable frame hives, patented in 1852, revolutionized bee keeping and are still preferred today. 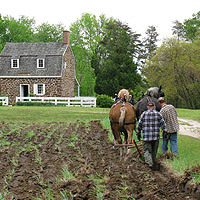 The farm field is an area where exhibition crops are planted and farming using historical methods is demonstrated. 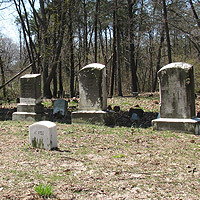 The Hancock family graveyard contains at least 125 head and foot stones. The graves are marked with headstones made of the local sandstone, which was readily available. While many of the tombstone’s inscriptions have worn away, several from the 19th and 20th centuries are still readable including one marked “A. H.” and dated 1809, which marks the grave of Anne Hancock, third wife of Stephen. Stephen’s grave is some distance away to the left and the space between the graves may contain the graves of Stephen’s children and earlier wives. War of 1812 Burning of Lion picture - wording to use: On August 24, 1814, a British raiding party, patrolling the Patapsco area in advance of their attack on Baltimore, entered Bodkin Creek and burned a “fine” American schooner they identified as being the “Lion of Baltimore”. That is the same name as one of America’s best privateers in the War of 1812 although, it turns out, there may have been more than one vessel of that name. Begin exploring the farm by selecting a point on the map and we will provide you with helpful information. 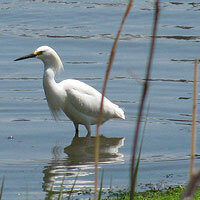 You can also find more Historical Information here. Move cursor over map points to explore.